The Yoga of Thai Yoga: How you use your body makes all the difference! 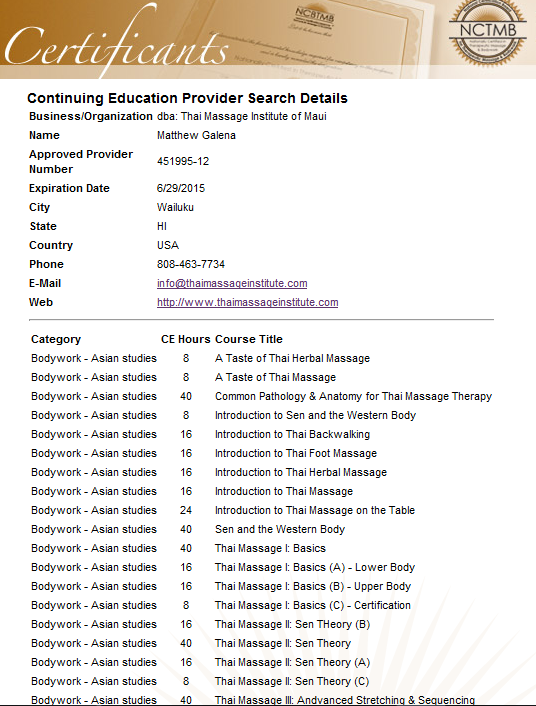 During this 35-Hour basic skills improvement course, students will practice the full basic learning routine each day under guided supervision, focusing on proper form for the practitioner, with refinement and variations for material previously learned in the prerequisite 40-hour foundational training, Thai Massage I: Basics. We will smooth transitions in the choreography, working out the kinks and your hesitation, building confidence throughout the full length of the routine. You will continue to learn how to use less energy in each movement, with simple adjustments to your shoulders, pelvis and midback. We will build your body awareness and positioning for your long-term comfort, and general viability for years of extended practice. Knowing the basic toolset is enough to get started, and over time each technique will evolve into a precise instrument, to conduct energy where you want it to go! The first step in taking your technique to that level is to start with the basics of form and positioning. Once you understand how to arrange and use your body to your own advantage, your technique will naturally deepen, and a small amount of concentrated effort will go a long way! Preventing Injury for a Longer, More Comfortable Practice! In Thai Massage, how conscious and aware you are of your body determines the stability, strength, ease, effectiveness and safety of your practice! Thai Massage performed with awareness of form and posture may seem almost effortless compared to doing the same work without this understanding. Poor alignment in the practitioner's body may force them to use too much energy to hold a position or to apply pressure. For casual enthusiasts, there's not as much need for concern... but for frequently active practitioners, chronic awkward or careless positioning may eventually create chronic problems, unless they learn and practice how to actively prevent such problems in the first place! Paying attention to correct body mechanics and posture from the beginning works to prevent such weakness, finding a solid form, so you may perform far more effective (and longer) Thai massages, using much less effort, with less impact on yourself! This Course is Required for the 75-Hour Basic Certification. This course, in any format, is required for students that seek a practitioner certification from this school. To be certified at any level, the instructor must have a certain level of confidence in your abilities, and most importantly this includes being able to observe and confirm that you understand how you can safely practice the basic art, for yourself and your clients, on a regular basis. Those who achieve Basic Certification will likely still perform like beginners (as is natural, until you gain more practical experience over time), but you will be "advanced" beginners, with a safe, solid foundation to build on! ** Includes the PREREQUISITE course, with this one. for free assumes you have already paid for both courses once. Check the schedule for specific days and times!